Tom Nixon started Nixon Homes in 1979 with a passion and commitment to build an exceptional home at an affordable price. 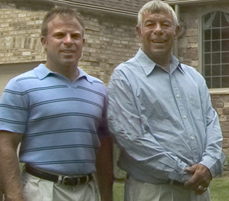 Thad Nixon, Tom’s son, has been an integral part of the family business for nearly 20 years. Together they have developed Nixon Homes into a company that values the importance of dedication to family, business, and the community. As a family-owned business, we have a hands-on approach in every step of the home building process, which allows for extraordinary quality, customer service, and value for our customers. What follows are some examples of those qualities that sets Nixon Homes apart from the competition. Nixon Homes is truly a custom builder - whether you are looking for the first home, expanding your family, or ready to downsize to retirement – we are the builder for you. We provide unique features that are standard in every one of our homes, which really sets Nixon Homes apart from the competition. Our building standards are set higher than any other builder in the area. In each of our homes, we select only the highest quality materials and provide superior craftsmanship. With a centralized approach, Nixon Homes is able to provide an exceptional product without sacrificing quality, while remaining extremely competitive. Our hands-on approach with each and every customer allows us to work closer with clients to control timing and quality of projects. Nixon Homes is not a mass producer, so each home is built to your individual specifications. Communication throughout the building process provides constant feedback to insure that you will have the home of your dreams.